Rub chicken with lemon juice and sprinkle well with salt and pepper. In a deep skillet, heat oil over medium high heat. Brown chicken on all sides until golden brown. Add the onion, tomatoes, sugar, and remaining lemon juice to pan and cook, stirring, until soft. Return chicken pieces to pan, add the wine and broth, and bring to a simmer. Simmer until chicken is tender, about 45 minutes. When chicken is almost done (around 40 minutes), heat butter in another skillet and sauté banana halves on both sides until golden brown. Use a large spatula to transfer the chicken with a little sauce onto a plate. 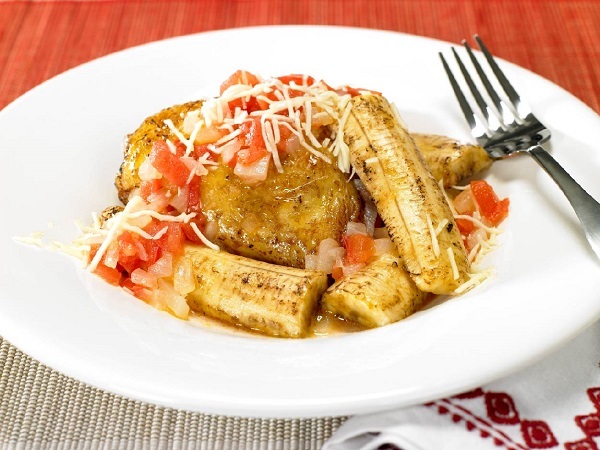 Arrange bananas on top of the chicken and sprinkle with parmesan cheese. Serve immediately and enjoy!